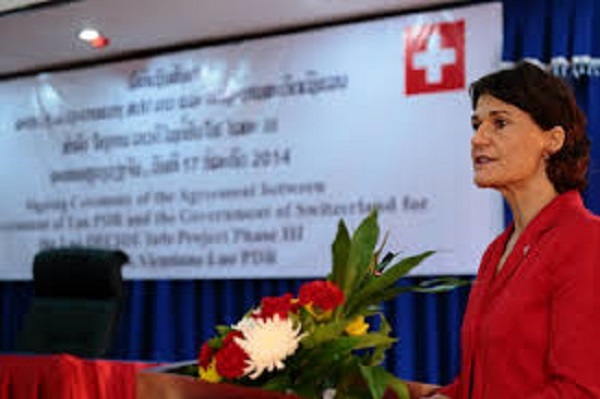 ZIMBABWE – Zimbabwe will soon be an economic hub in Southern Africa and Switzerland would not want to miss out on that opportunity, newly appointed Swiss representative to Zimbabwe, Mrs Ruth Huber said yesterday. Mrs Huber’s comments come hard on the heels of the release of the 2015 United Nations Development Programme report on Monday, that ranks Zimbabwe as having the fastest average growth in human development and the most improved quality of life in Africa. Zimbabwe topped the 52 countries surveyed, among them Botswana, Namibia and South Africa. European countries and the United States — that imposed illegal economic sanctions on Zimbabwe at the turn of the new millennium — have also been making overtures to engage Zimbabwe in a bid to benefit from the vast investment opportunities in the country that have seen China and Russia strike multi-billion mega deals with Government. Mrs Huber, who was speaking after presenting her credentials to President Mugabe at State House yesterday together with other new envoys from Canada, Malawi, Egypt and Kuwait, said she was looking forward to her four-year tenure in Zimbabwe. “It is really a pleasure and an honour for me to meet President Mugabe,” she said. “We had a very good exchange about the relations between our countries, about strengthening our relations over the coming years and strengthening our presence here. For us, Harare will be the regional development hub for Southern Africa, so it (Harare) is gaining importance in our bilateral relations. Canadian ambassador, Mr Kumar Gupta, said his focus would be on building on the “love and warmth” existing between the two countries. “We talked about bilateral relations and just the deep warmth that our two countries share,” he said. “I think the centrepiece of our relationship is people to people relations. Canada has partnered with Zimbabwe for many decades. The love and warmth between our people is deep and that is something I want to build on. Mr Gupta ducked off media questions on the illegal sanctions. Egyptian ambassador, Mr Moayad Fathallah El Dalie, said President Mugabe had advised him to ensure that bilateral relations are strengthened and benefit the general populace. “We discussed bilateral relations between our two brotherly and friendly countries,” he said. He said he had thanked President Mugabe for Zimbabwe’s support during the early ‘90s when Kuwait was under invasion from Iraq.